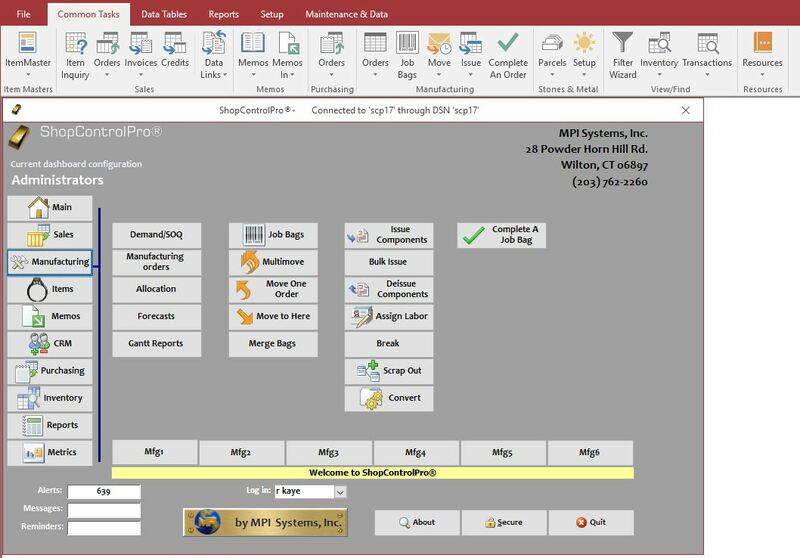 ShopControlPro® (SCP) is software designed from the ground up to meet the specific needs of the jewelry manufacturer by jewelry manufacturing and technology experts. It is NOT a modified generic program. We know what works in the industry and understand how to get things done quickly and accurately using robust and stable Microsoft® SQL Server technology. SCP is a true business class manufacturing and ERP system your business can depend on. Jewelry manufacturers, distributors, and wholesalers around the world depend on SCP to manage their daily operations. MPI is a Microsoft® Gold Certified Partner meeting the highest levels of competency and customer satisfaction requirements. Manage your entire operation in one comprehensive system. Build items in the ItemMaster specifying complete details of a piece with a detailed bill of materials, routing, and 4 image per item. Recalculate costs globally when metals and component costs change. Manage customers with our built in CRM. View full customer details including, sales history, on memo quantities, appraisals, quotes, and more. Maintain total control of the sales , manufacturing, purchasing and invoicing process with SCP-ERP™. Process Suggested Order Quantity calculations, order scheduling, purchasing, memorandums (in and out), EDI, sales, invoicing, customer specific pricing, manufacturing order tracking, loss control by quantity, metal weight, and stone weight. Maintain margins and control costs with purchasing, diamond parcel management and fully detailed costing on manufacturing orders. Unlimited number of security groups each with their own permissions for forms, reports and functions. ShopControlPro® utilizes an open database system so authorized users can extract data for their own reports and data analysis. Export data to Word, Excel or report writers. Casting and Finding item costing by metal price and labor. Total inventory control of all materials: jewelry, work in process, memo goods, samples, diamonds, stones, contractor work, vendor, salespersons, etc. Active reporting supports double click drill down to item, transaction, order numbers, customer, vendor, etc. MPI Systems, Inc. is a Microsoft ISV (Independent Software Vendor) Partner.